Not since our honeymoon cruise aboard the MV Horizon (which is not even with Celebrity anymore), we've haven't been back aboard a "small" cruise ship. 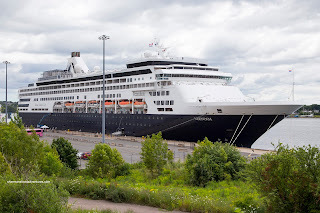 Well, not until our latest foray out to the Maritimes aboard Holland America's MS Veendam. 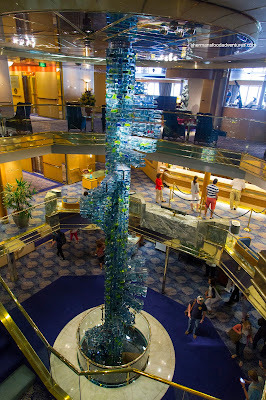 We really didn't choose the ship per se, rather the itinerary was the real draw. Besides, they can't really cruise down the St. Lawrence aboard a mega cruise ship anyways. 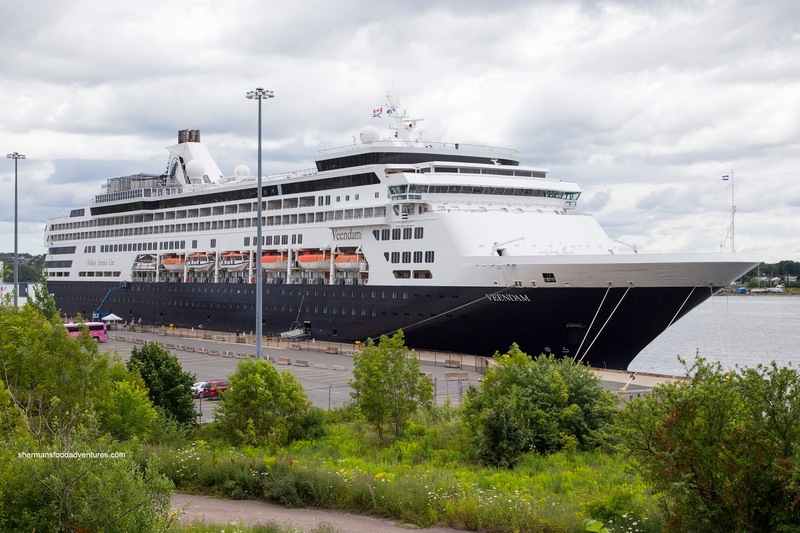 Listed with a gross tonnage of only 57,092, the MS Veendam is a little over 10,000 GT larger than the MV Horizon. 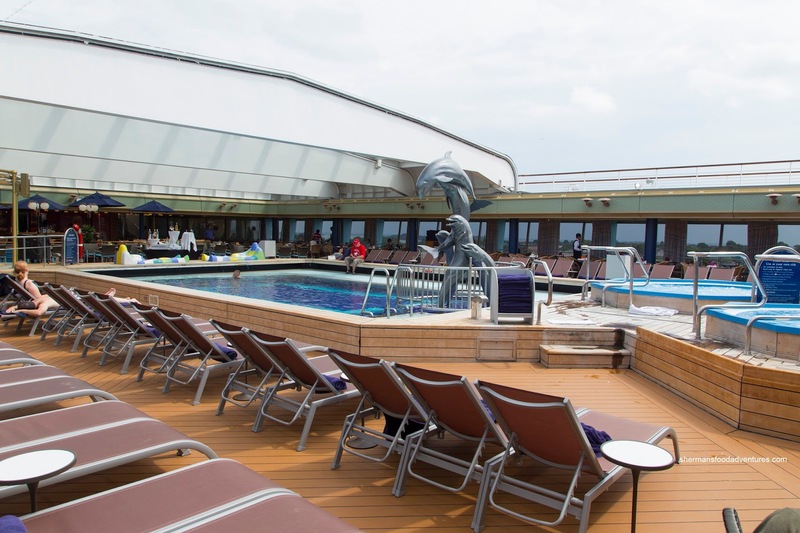 With that, we had reasonable expectations regarding the onboard amenities and the lack of modern appointments found on ships like RCCL's Allure of the Seas. Due to the modest amount of passengers, the boarding process at the Black Falcon Terminal in Boston was fast and painless. We were aboard the ship within 20 minutes of arriving at the terminal. 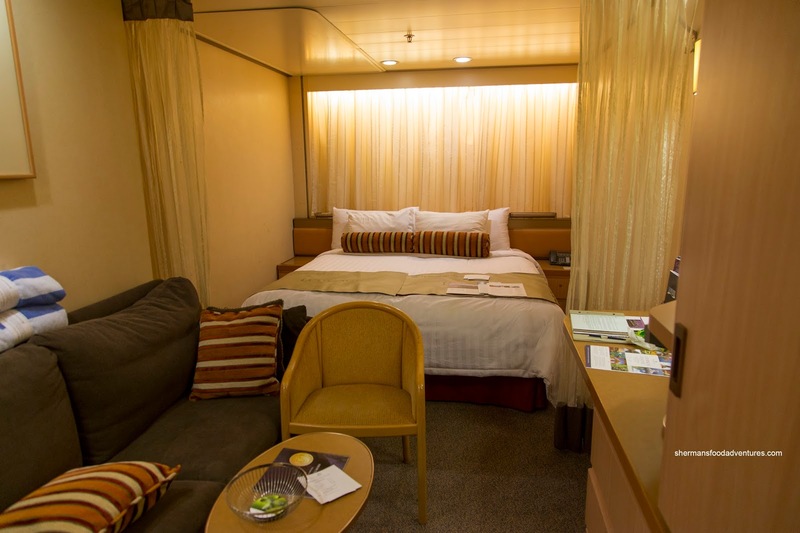 For the first time ever, we settled on an inside cabin since there was only one sea day on the itinerary. Hence, very little time aboard the ship and subsequently in our room. As you can see, the room was compact and especially so since we had the kiddies with us too. The extra chair was in the way, so we had the cabin steward remove it. The sofa converted to a bed and there was another bed that lowered from the ceiling. There was a surprising amount of storage space and we didn't have an issue with hiding all of our clothes and knick knacks away. The washroom was pretty standard being small and only consisting of a stand up shower. For a small ship, there was actually a 3-story atrium complete with an interesting glass staircase/DNA-looking centerpiece. It did look rather dated with the shiny brass accents though. I guess we should've considered ourselves lucky since the MV Horizon had a hallway for a lobby. Housed on the 7th floor, the front desk was somewhere we had to visit one too many times. You see, our door lock malfunctioned due to the battery being low. However, it took far too long (over 24 hours) and 3 trips to the front desk for it to be fixed. Imagine returning from the gym sweaty and gross and not being able to access our stateroom? We did get a shipboard credit for our inconvenience, but this should never happen aboard a cruise. Overall, the service was good, but not outstanding. Other than the front desk and our cabin steward (and assistant), the rest of our interactions with the staff were hit and miss. I really didn't appreciate the one lady that asked me if it was "necessary to have access to my room". Um... WTH??? 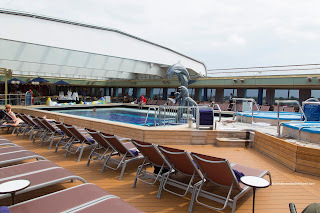 On the Lido deck, we found the one small pool and accompanying hot tubs. Nothing particularly special about them, but again, they did their job. With a retractable roof, it also meant we could use the pool area even if it was raining. There was also a set of adult-only hot tubs at the back of the ship as well. Also at the back of the ship was Club Hal (the kids program). Although Holland America has never been known for their comprehensive kid's programs, this was sufficient with friendly and competent staff. The actual club itself was small, yet still relative to the size of the ship and the clientele (where there are fewer kids). As mentioned before, I had visit the gym facilities (yah shocking...) and it was more or less a serviceable one with some free weights as well as treadmills and a small area for aerobics. 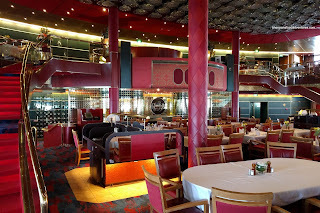 Now to the good part, the main dining room was split into 2 levels with one being less formal than the other. There was a mix of fixed seating (which we had) and walk-in traffic. Food in general was pretty solid, especially for a cruise ship, albeit a smaller one. Service was pretty good, yet hurried at times. The other dining options included the Pinnacle Grill, Canaletto, Lido Cafe, Slice Pizza and Dive-In Burger Bar. We tried them all and there will be dedicated posts in the next few days. We ended up skipping the crowded and chaotic buffet for our welcome aboard lunch. Since we were past Holland America cruisers, we were afforded the opportunity to dine in the Rotterdam main dining room for our welcome aboard lunch. Not that we don’t like the buffet, this was more of a relaxing way to start our trip rather than fighting for seats and food up at the Lido Cafe. 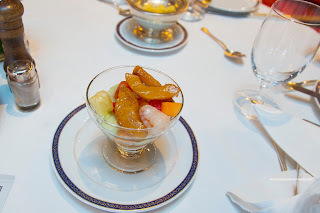 The first thing I ate on the cruise was the Fresh Fruit with Peach Schnapps which was a fairly simple appetizer consisting of honeydew, cantaloupe, watermelon and pineapple. All of the fruit was indeed fresh while not really all that sweet. I found the melon somewhat firm. 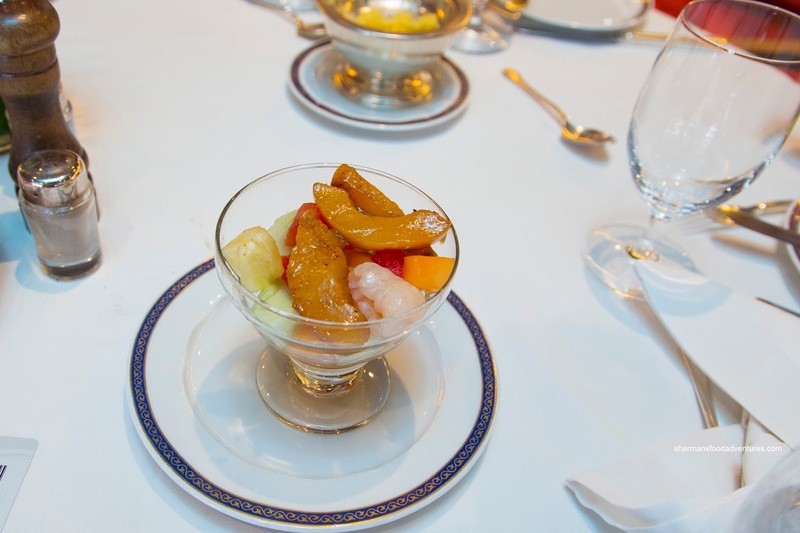 The best part was the marinated peach segments which were soft and flavourful with the obvious hit of schnapps. 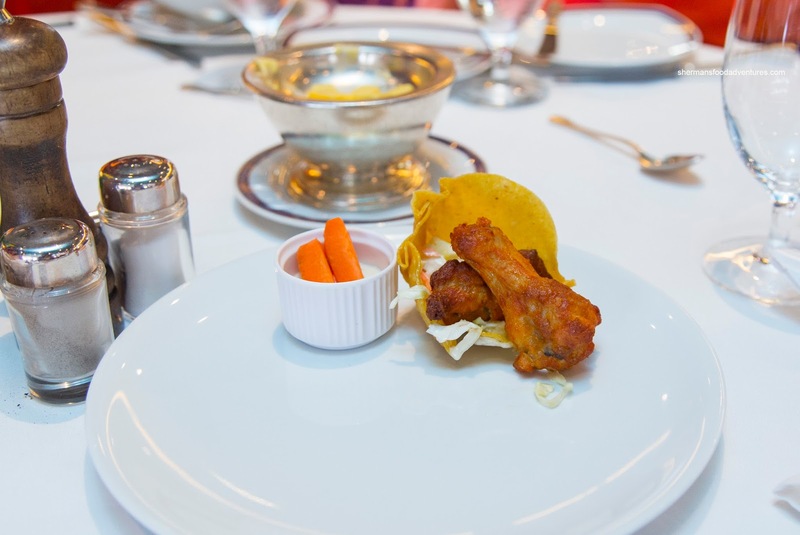 Viv had the Buffalo Chicken Wings in a corn tortilla basket which were a bit dry while the skin wasn’t completely rendered. These looked baked rather than fried. They weren’t really all that spicy either. 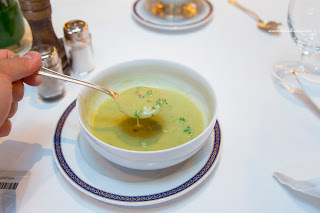 My daughter went for the Cream of Broccoli with toasted pine nuts as her starter and it was quite good. The consistency was thick, but not overly creamy. There was a considerable amount of broccoli blended into the soup which also was exemplified in the taste. We thought the soup was well-seasoned and balanced. 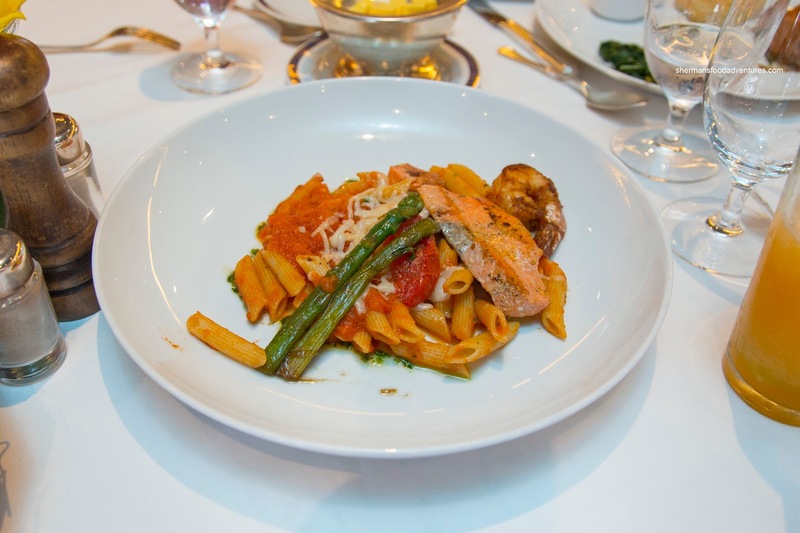 For her main, she had the best of the bunch in the Seafood Penne in a light tomato sauce. The sauce was mild, but was still flavorful and tangy. The penne was al dente while the prawn was nicely textured and seasoned. The piece of salmon was a bit salty though. 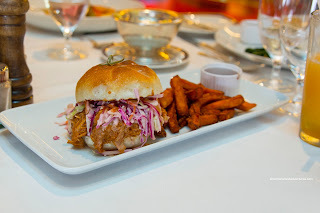 For my main, I had the disappointing Pulled Pork Sandwich with coleslaw and yam fries. The best part of the dish was the crispy fries and that’s not saying a lot. I found the sandwich to be overwhelmed by the taste of raw onion. It was in the coleslaw and the juices had seeped into the pulled pork. Even the gratuitous amount of sweet and tangy BBQ sauce didn’t help things much. I didn’t even like the bun as it was too dense and chewy. 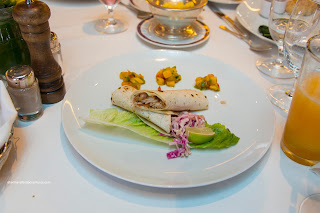 Viv decided on the Blackened Mahi Mahi Tacos for her entree and it was decent. Although small, the rolls featured tender fish that was lightly crispy. Flavors were mild, but still there was some spice and tang. 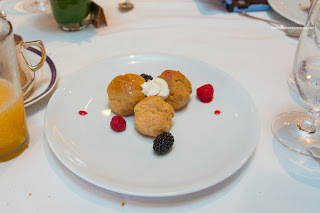 For dessert, I tried the surgar-free Berry Bollen which were filled with yogurt wildberry mousse. I found the choux pastry to be a bit dry, but still fairly soft (forgiveable due to the absence of sugar). Inside, the yogurt was fluffy and not too sweet. 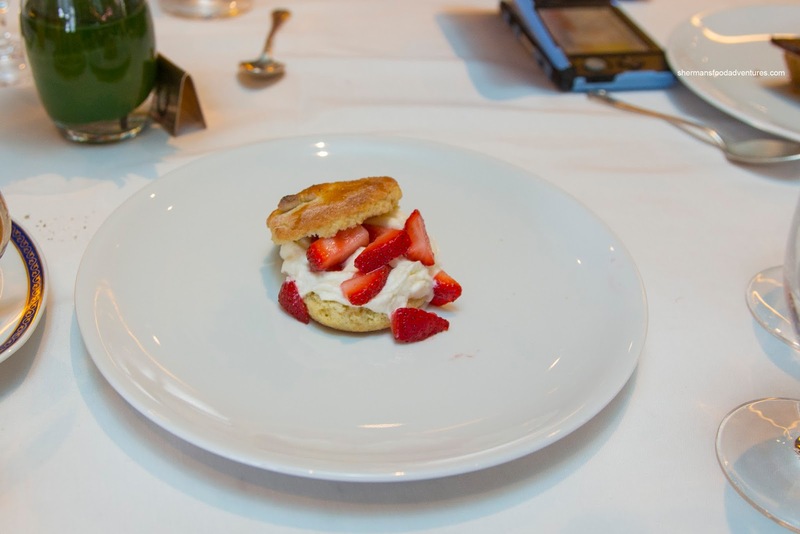 Something along the same lines was the Strawberry Shortcake filled with Chantilly cream, basil and fresh strawberry segments. This was a refreshing and light dessert with actual shortcake (not sponge cake). Hence, the texture and consistency was more dense and flaky. It worked well with the soft and wet ingredients as it held up and also provided a textural contrast. 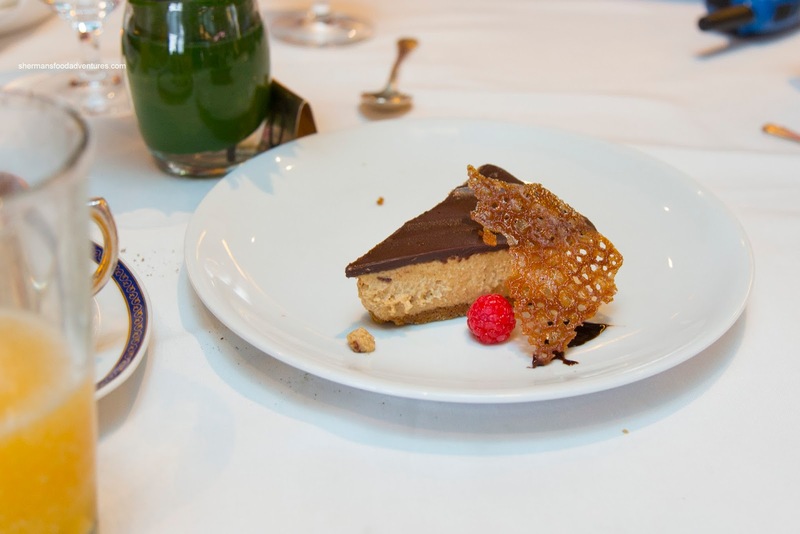 Lastly, we tried the Peanut Butter Silk Pie with graham cracker crust and chocolate sauce. This tasted somewhat like a really big peanut butter cup except less sweet. The peanut butter filling was indeed silky and smooth while the chocolate added only a mild amount sweetness. We felt the desserts as a whole was pretty good, but the other items were definitely hit and miss. On the other hand, it was only lunch and the first one at that. There was much more food to come, including alternative dining. From past experience and also based on this cruise, Holland America does serve up better food than most of the immediate competition. In terms of service, we found it to be inconsistent on this cruise compared to the one on the Oosterdam. Amenities were lacking due to the size of the ship, but it wasn't a big deal due to the busy itinerary. I do believe this is a great way to get a taste of the Maritimes in one complete package. - Great itinerary except for Sydney, N.S.